Craig Campbell with a monster footplant. This was taken from a Life’s a Beach ad from 1988. Craigs style was always so ahead of the curve. 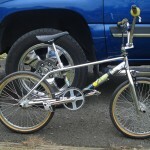 The way he rode, his clothes, and everyone wanted an Ozone set up like his! All hail the man who ushered in the 90’s!Tell me why you loved Craig in the comments! This entry was posted in Photos and tagged Craig Campbell, footplant, Lifes A Beach, Ozone. Bookmark the permalink. Sequence by Spike? He did a bunch of Life’s A Beach ads that came together just from hanging around and riding with people after work. This was at Wizard pubs after the half-pipe was taken down from the parking lot. Stoked to see my ’71 Dodge Demon in the background. Craig was always popping off and finding cool ways to use what was around.